If you’re anything like us, you’ll find clowns a bit scary. Whether it’s because the ill fated circus performers have been utilized time and again in horror stories, or whether it’s actually just their (kinda terrifying) makeup and oversized shoes that get you, they are just kinda scary. Now, like a plot from Stephen King’s It, it seems that there’s a creepy clown doing creepy stuff IRL. One apartment block in Greenville, South Carolina are currently living in fear after a clown was spotted trying to lure children into the woods. 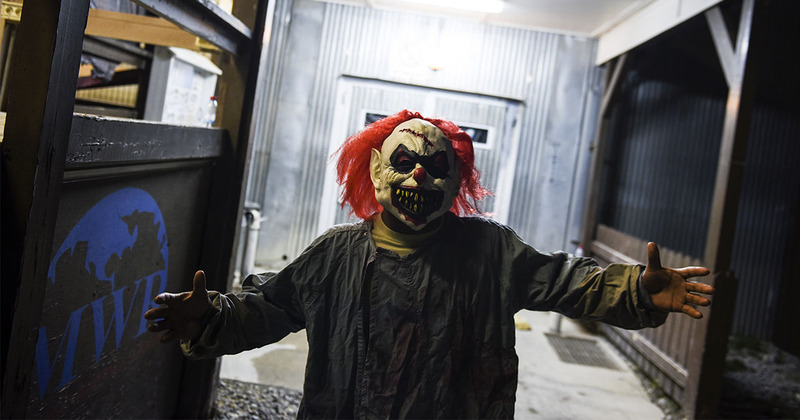 In a letter posted by the apartment block’s manager, residents of the Fleetwood Manor Apartment complex were warned about concerns regarding the clown. “There has been several conversations and complaints to the office regarding a clown or a person dressed in clown clothing talking to children or trying to lure children into the woods,” the letter reads ominously, before detailing that children’s safety is of upmost priority and that children shouldn’t be left wondering around alone or past the curfew of 10pm. In a statement given it Buzzfeed News, Greenville County Sheriff’s Office spokesman Master Deputy Drew Pinciaro said that an unidentified witness called police on August 20 to complain about a man dressed as a clown with a blinking nose loitering around the woods. Donna Arnold, who lives in the complex, spoke to both CNN and Buzzfeed about the incident. The Fleetwood Manor Apartment complex isn’t the only place to complain about clowns stalking the area. Today (30 August), WYFF News 4 reports that residents of Emerald Commons on Whitehorse Road also spotted a man wearing a clown mask in the area. The two locations are 20 minutes apart. “My grandchildren’s experience was the clown was at the the bottom of the hill and they started running at the top of the hill and there was a lady running and saying get the kids in the house,” one resident said, while the shift lieutenant said that residents had seen someone riding a bicycle wearing a clown mask. According to reports, it’s unknown whether the two clown sightings are linked. Okay, this is SO creepy, right? If you live in South Carolina, please keep yourself and, if you have them, your children safe and if you see a clown make sure to call the authorities.